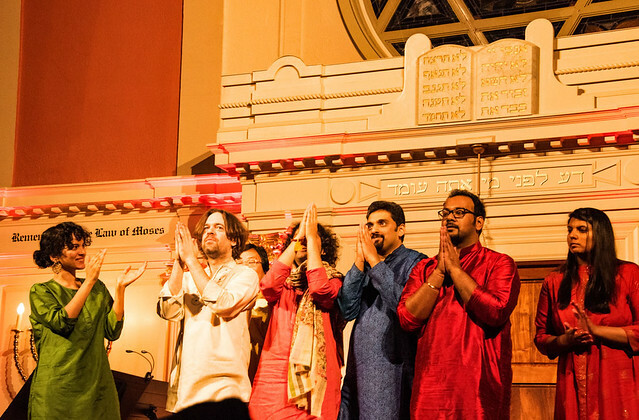 Posted on 03/28/2019 by Mark Caicedo	in Live Review and tagged Anoushka Shankar, folk, India, Indian classical, Sixth & I, world music. You may wonder why a review about virtuoso sitar player would start with lyrics from a classic Neil Young rocker but bear with me. It will become clear soon enough. 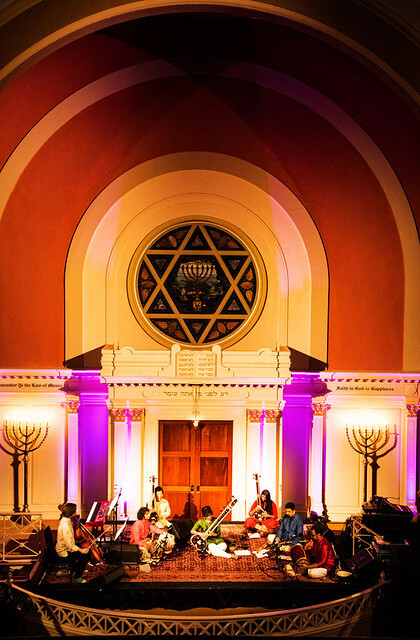 You see, Anoushka Shankar appeared at Sixth and I Synagogue for two shows recently. My first introduction to Ms. Shankar came late one chilly winter night in the mountains of North Carolina when the tribute film to the late George Harrison, “Concert for George,” happened to be playing on the one channel our little television could receive. 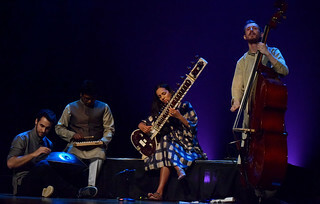 The first part of the concert features a full orchestra with Anoushka playing sitar, conducting, and jamming with Eric Clapton. I was spellbound. 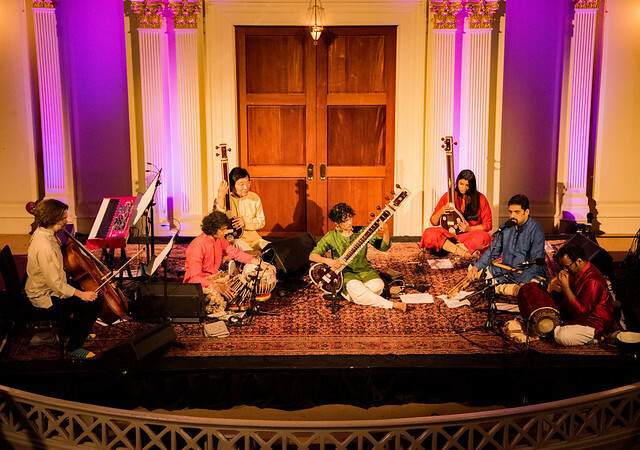 This was not the classical Indian music The Beatles introduced to Western culture in the ‘60s. This was something ambitious, unique, compelling. And it rocked. Soon thereafter I got her 2005 album, Rise (Angel Records), which was a highly successful marrying of the classic sitar sound with Western musical structures and melodies, incorporating jazz, pop, and pan-ethnic world music, rising to #2 on the Billboard (US) World Albums chart. Rise has been a musical staple in our household ever since. Her next album, 2007’s eclectic Breathing Under Water, was a collaboration with Karsh Kale and featured guest musicians including her father Ravi Shankar, sister Norah Jones, The Police frontman Sting, among others and blended styles as diverse as Indian classical music, electronica, dance, and folk. Musical exploration continued with Traveller (Deutsche Grammophon), released in October 2011. Recorded in Spain and produced by flamenco guitarist Javier Limón, the album’s creative process involved Anoushka and Javier, in essence, jamming in the studio developing a musical conversation that eventually transformed into the album’s finished pieces. Watching and hearing an artist mature as she takes on new musical challenges has been both a pleasure and a privilege. Her first three albums prior to Rise, focused primarily on traditional Indian music early and reflected her tutelage under her father. 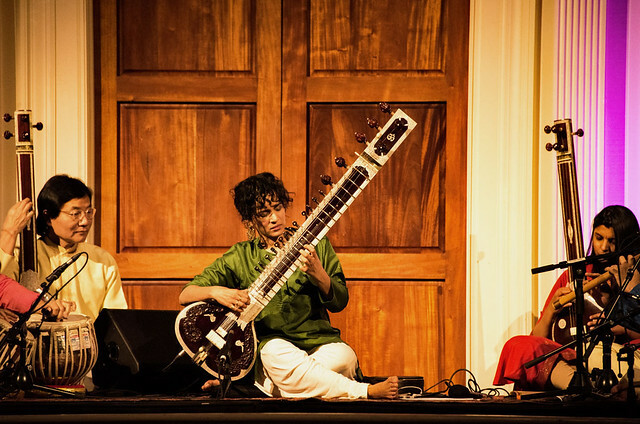 But since then, Anoushka has emerged as ground-breaking composer, performer, and recording artist. 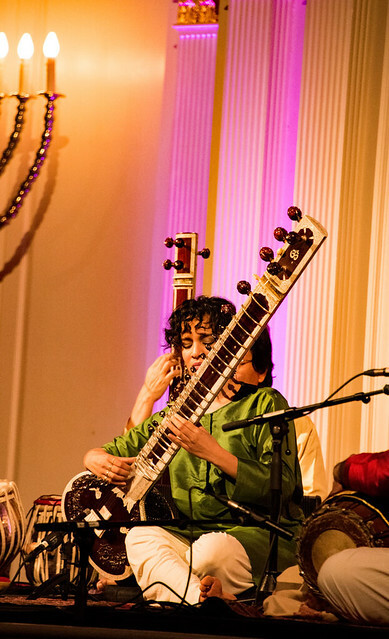 Her 2015 release, Home (Deutsche Grammophon), was a return to traditional classical Indian Ragas. The following year’s Land of Gold (Deutsche Grammophon), with Rapper MIA, German-Turkish singer Alev Lenz, and British actress Vanessa Redgrave, drew on diverse influences to make a cohesive musical statement, in this case regarding the unfolding Syrian refugee crisis. 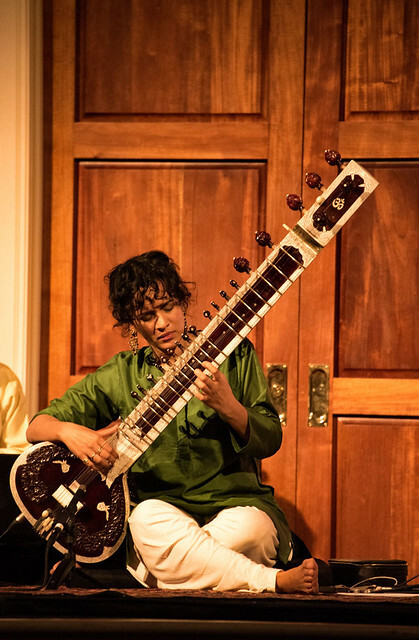 Anoushka has performed at the Kennedy Center, Lisner Auditorium, and Sixth & I on nearly an annual basis for the past decade, I was privileged to see her perform with her father twice at the Kennedy Center before Ravi died in 2012. The following year, I attended her concert at Lisner Auditorium when she performed much of the Traveller album with a band that included a lead vocalist and flamenco guitar. 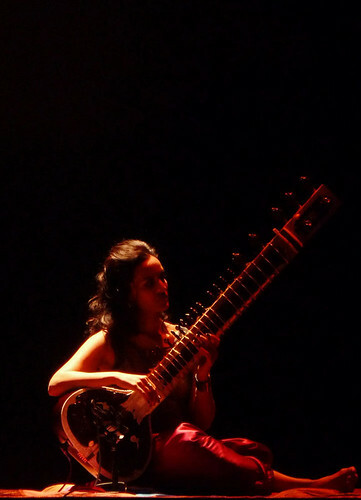 Anoushka Shankar at Lisner Auditorium, Nov. 15, 2013. 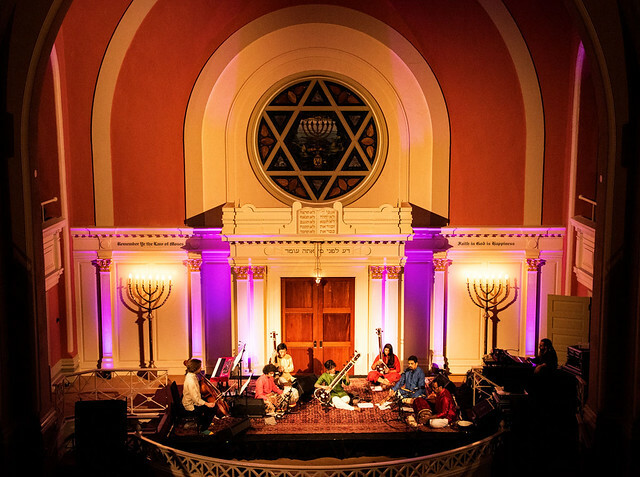 In 2016, she returned to Lisner Auditorium to perform Land of Gold in a quartet format that included master percussionist, Manu Delago; Sanjeev Shankar, master player of the shehnai, an Indian reed instrument; and Tom Farmer, a virtuoso on double bass. 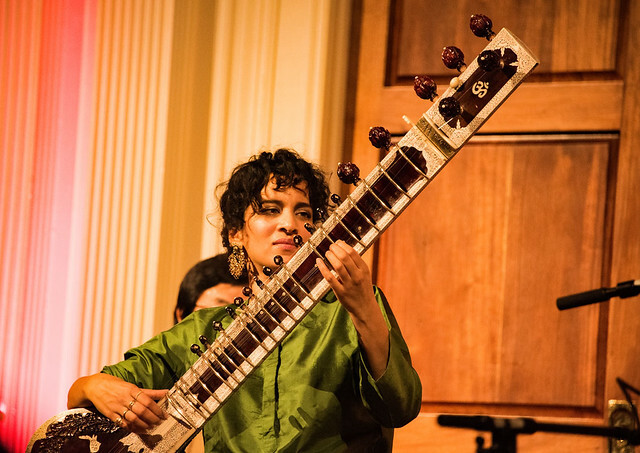 Anoushka Shankar at Lisner Auditorium, April 1, 2016. 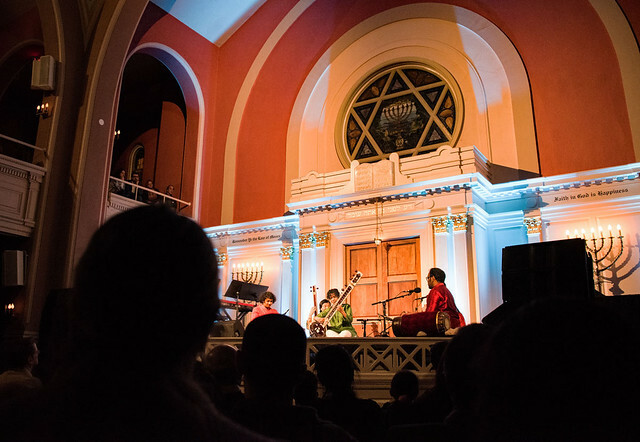 On this latest tour, she brought along a larger ensemble that includes Ojas Adhiya: tabla; Pirashanna Thevarajah: mridangam, ghatam, moorsing; Ravichandra Kulur: flute; Danny Keane: cello, piano; Kenji Ota: tanpura; Archana Prasanna: tanpura. The result was a full orchestral sound with changing time signatures, use of volume and silence to emphasize certain passages, and space to highlight the individual players’ virtuosity. 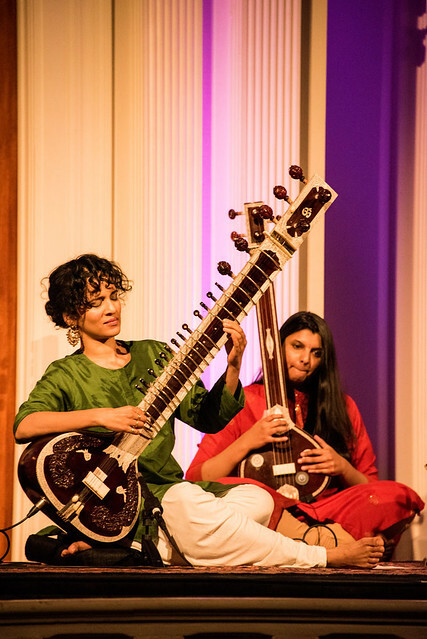 But for all the serious musicianship and the depth of talent on display at an Anoushka Shankar performance, there are always two things that stand out for me. The first is the infusion of humor and sense of fun among the players onstage; they were always smiling at each other, whether it’s at a flubbed note, or a particularly thrilling passage. 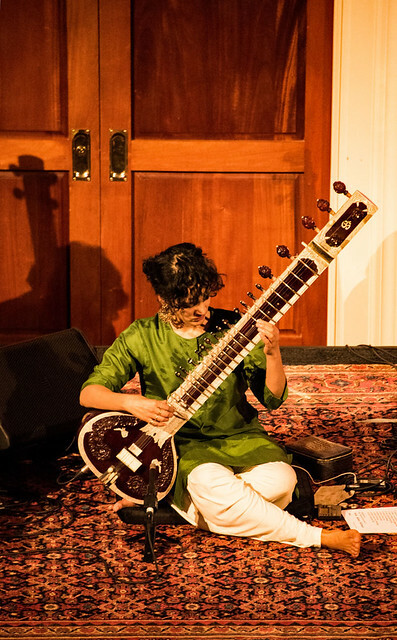 The second involved that Neil Young quote — at times, Anoushka will simply lay down her sitar and close her eyes, soaking in the cyclone of sound swirling about her. She became the eye of the musical storm, keeping time with hand flips, conducting her onstage companions while inviting the audience to bathe in the melodic rain cascading all around. Those were the moments I was blown away. Anoushka will be touring again in a few weeks. Check out her schedule, videos, and more music on her website. 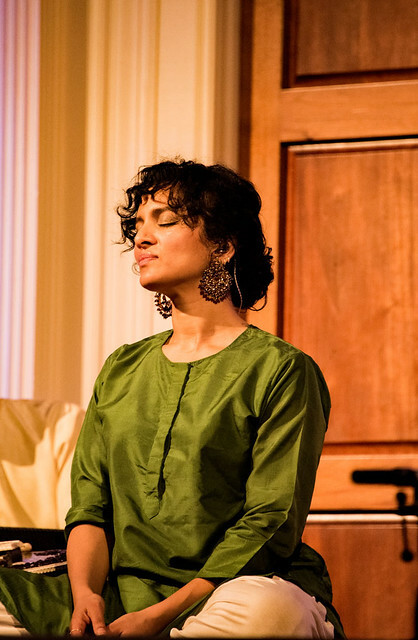 Here are some photos of Anoushka Shankar and company performing at Sixth & I on March 23, 2019. All pix copyright and courtesy of Mark Caicedo.